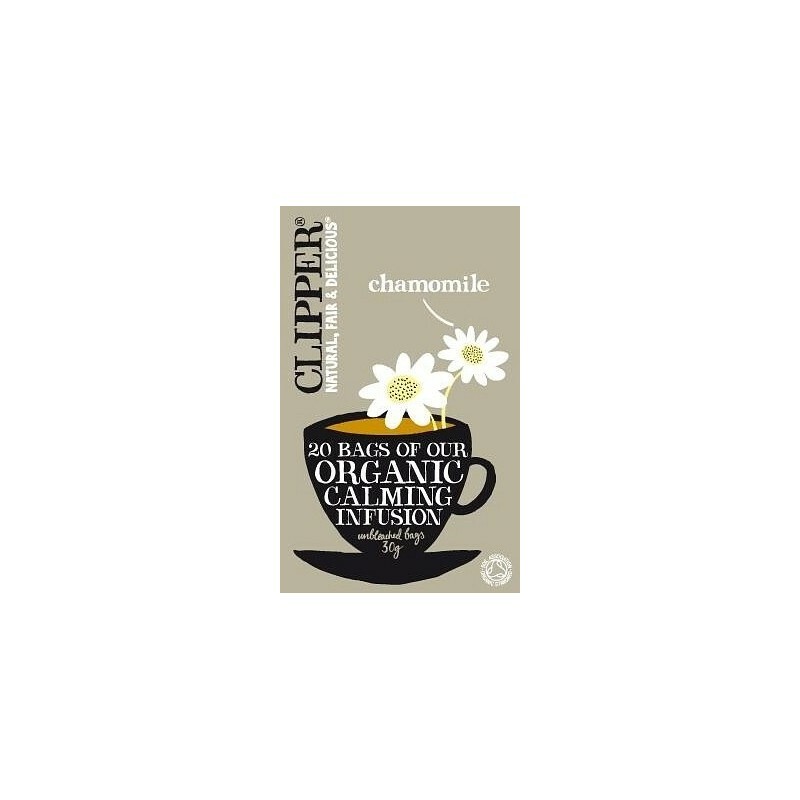 Clipper Chamomile is produced solely from organic chamomile flowers and makes a wonderful calming herbal infusion with a sunny, golden colour. 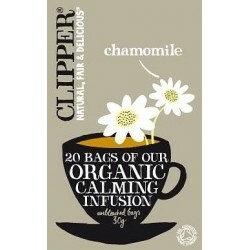 Perfect to help unwind and relax after a busy day. 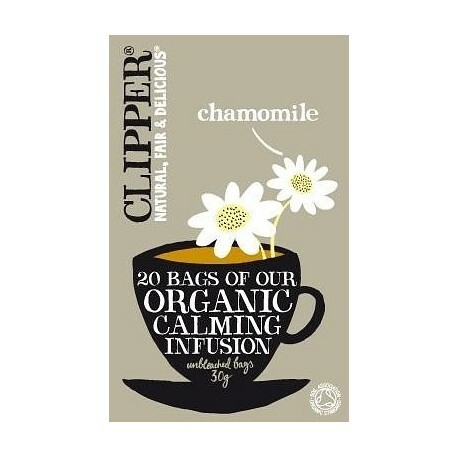 Clipper products are not, Irradiated; See Dangers below. Food Radiomimetic effects are similar to radiation effects, but are not caused by radioactivity. To the body radiomimetic effects are equally harmful as radiation effects. There is a wide range of unique chemical changes that result when food is irradiated. These compounds are truly unique because they are never formed during other food processing techniques such as cooking and freezing. To illustrate, an article by George Tritsch, who has over 36 years of expertise in the field of cancer research at the Roswell Park Cancer Institute, states that 30 mg of sucrose (table sugar) when irradiated will create 0.05 mg of formaldehyde, which is a carcinogen (2002). Tritsch also states that 0.05 mg of formaldehyde is "clearly a mutagenic dose"(p. 757). Moreover, the formation of alkylcyclobutanones in irradiated food is admitted by Health Canada (Health Canada, 2002). The toxicity of alkylcyclobutanone consumption is disputed and there is conflicting data. Some studies indicate alkylcyclobutanones are genotoxic, will cause DNA damage and promote the growth of cancer cells, whereas other studies do not prove any adverse effects (Gadgil & Smith, 2006). Donald Louria, Medical Doctor, Professor and Chairman Emeritus at New Jersey Medical School, brings forward three studies, each of which confirm that consuming irradiated food causes chromosomal breakage in humans (2001). Neurological damage, immunodeficiency, mental retardation and microcephaly are caused by chromosomal breakage (Carney, 1999). The three studies upon which Louria relies are relatively small, which only serves to prove much more extensive research must be done before the proliferation of irradiated food is encouraged. To administer food that has potential to cause chromosomal breakage to vast populations of people would be reckless and unwise. Accounting for the formation of formaldehyde and alkylcyclobutanones, as well as the likelihood of chromosomal breakage, it is clear that the unique chemical differences present in irradiated food are cause for much concern to Canadians. How can cobalt-60 affect people's health? All ionizing radiation, including that of cobalt-60, is known to cause cancer. Therefore, exposures to gamma radiation from cobalt-60 result in an increased risk of cancer. whether the cobalt-60 was ingested or inhaled. Irradiated herbs, seasonings and spices are exposed to HALF A BILLION chest X-ray's worth of gamma radiation. This information is clearly publicized by the USDA and FDA. The level of gamma-radiation used starts at 1 KiloGray -- equivalent to 16,700,000 chest x-rays -- and goes all the way up to 30KiloGray (500,000,000 chest x-rays or 10,000 times a human lethal dose).